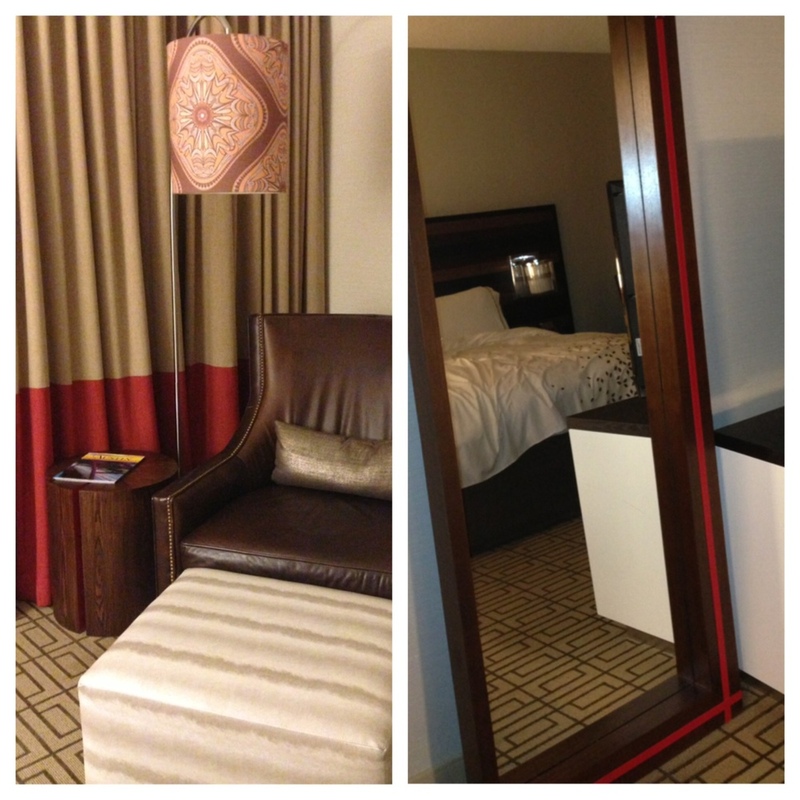 This past week I had a work conference and stayed at the Renaissance Hotel in Austin for three days and two nights. They recently updated their hotel and I thought the new lobby and rooms were especially nice. I took a few pictures of my hotel room since I thought there were several design concepts that would work well in a home as well. The room had a lot of browns, deep espressos, and reds tied in throughout the space. Artwork in the room consisted of black and white photos of boot spurs, guitars, and other "Texas-themed" pieces. I especially appreciated the graphic aspects of the room. The pattern on the comforter could also be carried over into a graphic on one of the walls, as an accent on a lamp shade or even on top of a painted piece of furniture. I love all the patterns and various colors they put together in the reading nook space. Those curtains could be made by either sewing too different fabrics together or painting part of a lighter curtain with a bold choice. I'm also currently obsessed with the wooden side table trend and wish I could create something like this with an old tree base. The red accent in the curtains was tied into the rest of the space with red leather around the side mirror and as an accent wall in the closet. 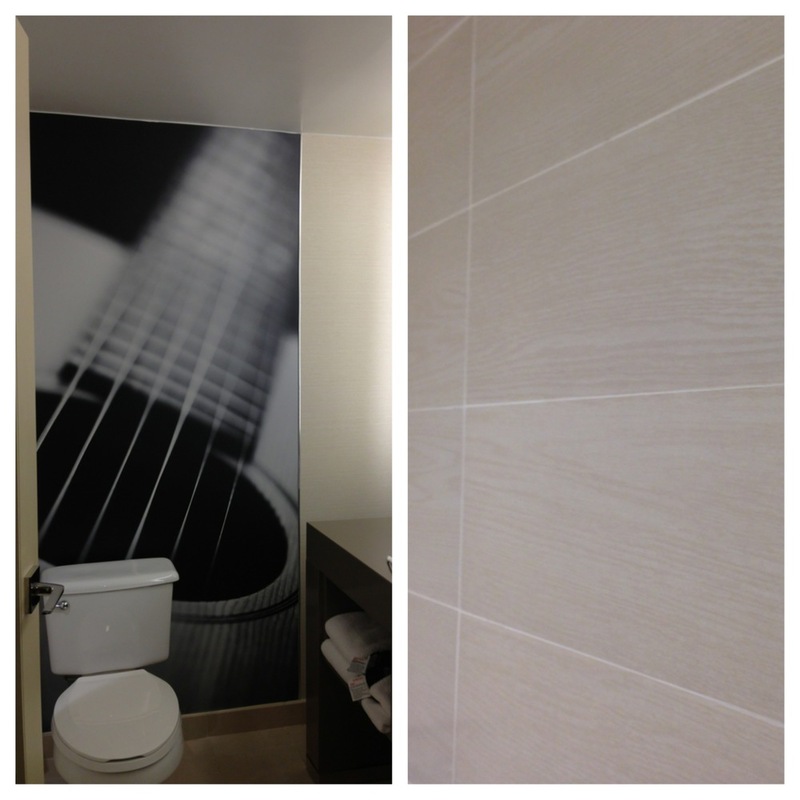 Hotel bathrooms often go overlooked so I was pleasantly surprised with their choices in this room too. I loved the large graphic of a guitar on that back wall. I wonder if this could be replicated with an oversized poster and mod podge to foam board (or even directly to the wall perhaps). I also thought the tile they used in the shower and behind the mirror was really interesting. It had a wood-grainy look to it and was cut in large rectangle pieces which made the shower/tub feel larger and more spacious. I'm glad the conference is over and was well received, because I very much enjoyed sleeping in my own bed again last night. But hotel stays can certainly be a fun break from the norm and I'm looking forward to staying in more neat spaces like this one! Now I'm going to get on my painting clothes and start working on my office desk and craft table that Keith finished building last weekend. More pictures coming soon! Top: plank wood top of office desk. Bottom: long office desk on left, folding craft table on right.